Under FMLA (Family Medical Leave Act) and CFRA (California Family Rights Act), the employer may require an employee to submit a certification by the employee’s health care provider to confirm the existence of the medical condition, qualifying for FMLA or CFRA medical leave. The certification “shall be sufficient if it includes all of the following: (a) the date on which the serious health condition commenced; (b) the likely duration of condition; and (c) a statement that, due to the serious health condition, the employee is unable to perform the function of his/her work position. Cal. Gov. Code section 12945.2(k)(1). Clearly, the above law provides that the privacy rights of the employee’s medical condition have to be protected, and that the FMLA/CFRA certification should be general enough to avoid disclosure of sensitive medical information, such as an employee’s specific medical condition and diagnosis when not immediately relevant to the request for medical leave. This can be particularly important if the employee is about to undergo a politically/socially controversial procedure such as vasectomy or abortion, or if the employees has a condition that carries a certain social stigma, such as any sexually transmitted disease, including HIV. No employee would be interested in having his relationships with co-workers and superiors affected by undergoing a procedure that some people oppose on moral, political or religious grounds. After all, it is not uncommon that revealing such sensitive information give rise to conflicts at work place and even harassment and discrimination. An employer who “has a reason to doubt the validity of “the employee’s health certification “may require, at the employer’s expense, that the employee obtain the opinion of a second healthcare provider, designated or approved by the employer, concerning any information certified. If there is a difference in opinion between the two evaluations, the employer may require, at the employer’s expense, that the employee obtain the opinion of a third health care provider, designated or approved jointly by the employer and the employee. In that case, the opinion of the third provider will be binding on the employer and the employee. Cal. Gov. Code section 12945.2(k)(3)(D). 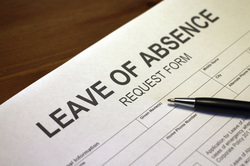 During the employee’s medical leave, the employer must continue to provide the employee with health benefits, and upon return to work, the employee must be given the same seniority as before the leave was taken. Cal. Gov. Code section 12945.2(g). To make sure that your FMLA request is properly written, please refer to our suggested FMLA Request Form.